Submitted by: Diane Capuano, O.P. 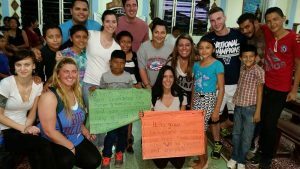 For the past 4 years, employees and students from Dominican College in Blauvelt, New York and Molloy College in Rockville Centre, New York have travelled to El Salvador to assist Dominican Sister of Amityville, Flor de Maria Buruca, in running a faith based camp for the children in the small village of Sol Naciente. This year, January 2nd thru January 11th, 9 students and 4 employees once again had the privilege of participating in this life changing experience! 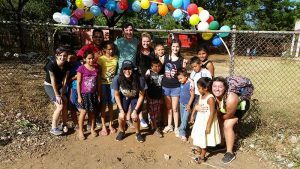 Elizabeth Meittinis, a student from Molloy College and a member of Dominican Young Adult Molloy Chapter and the current Coordinator for Mission for DYA-USA was one of the students on the trip. Forty five children, ages 3 to 12, attended this camp. Some teenagers and adults from the community also participated as camp counselors and were a big help to all of us from the United States!! This faith based camp is deeply rooted in Dominican Life and Spirituality. The theme for the camp was Catherine of Siena’s famous quote, “Be who you are meant to be and you will set the world on fire!” Each morning the children took time in song and prayer before being greeted by St. Catherine of Siena (played by a student from Molloy College) for the “religion lesson” for the day. Each day focused on a different aspect of Catherine’s life. The children were given homework assignments that corresponded with the focus for the day. This short session always ended with the singing of “This Little Light of Mine” in English and in Spanish and with four short phrases, in English and in Spanish, taught to the students from both colleges by Dominican Sister of Blauvelt, Barbara McEneany. The phrases “Raise the praise, Minimize the criticize, Increase the peace, and Silence the violence,” as well as the song, will be remembered by the children and the students as well! After the opening session, the children were then divided into 3 groups and alternated going to music, arts and crafts and sports. Each group had a student that was fluent in Spanish to act as a translator for the other students. After lunch, all of the children participated in a Community Service Project. This year the children helped to beautify the garden outside the chapel where the camp took place. They gathered materials from around the neighborhood like plastic bottles and rocks and used these to create fences and enclosures for the plants. What an example for those of us from the United States who tend to waste materials that can be used for other purposes! The camp ended with a beautiful closing mass in which 4 children were baptized and 4 children received First Communion. The chapel was decorated so beautifully by members of the Sol Naciente community. At the end of the mass, the children who attended the camp all received certificates and the students and mentors from the colleges received a Dominican Cross and a beautiful plate with St. Catherine painted on it. The tears flowed from all as we said good-bye to the children and the beautiful people of Sol Naciente!!!! were distributed to the people. The students helped in preparing these food bags the night before and in the distribution. We also had a great time celebrating with the people dancing, singing and watching the children enjoy a piñata! We also visited some of the historic places in El Salvador. Visiting where Blessed Oscar Romero lived and was murdered, the Jesuit University where the Jesuits and their cook and the cook’s daughter were murdered, the wall in San Salvador that lists the names of all that were murdered, and where the MaryKnoll sisters are buried, deeply touched our hearts and souls and made us acutely aware of the terrible injustice this country faced and continues to face in so many ways! In San Salvador, we felt right at home in the church of El Rosario in San Salvador which is a parish run by Dominican Friars. The time went by very quickly and I know we all left El Salvador with a greater appreciation of the culture and the people! Our fears of not speaking the language quickly disappeared as we realized that the language of love breaks through all fears and obstacles! 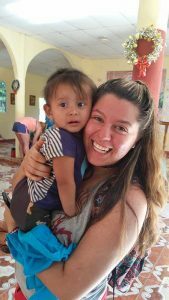 For Elizabeth Meittinis, our Dominican Young Adult member, this trip and being with Flor certainly deepened her commitment to our Dominican Life and Charism. I truly believe this experience of collaboration deepened everyone’s understanding of Dominican Life and Spirituality. It was a time of living out the 4 pillars of Dominican Life in a very tangible way!